In picture: Tori dancing in Sokone. 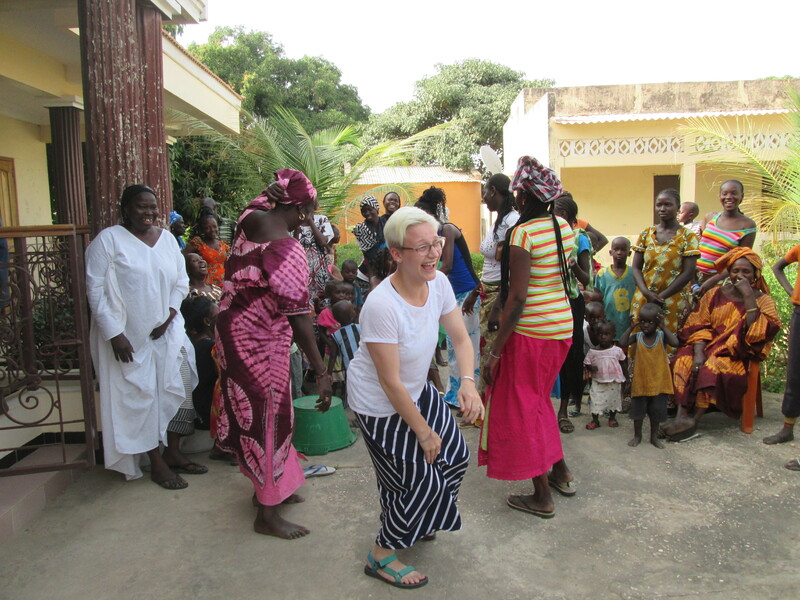 The women would come over to the group of Toubabs and select someone to dance. Tori was selected most frequently, which seems only fitting anyway since she won our group dance competition. Tori, however, was not amused. I’m spending the weekend with my classmates in Toubacouta! I just arrived today, Thursday, and will be here until Sunday night. We have a lot planned and I’m sure you will hear more about it! It’s already been an amazing trip. The MSID program is truly incredible. Toubacouta is a somewhat touristy but village type place several hours south of Dakar. I’m excited to get off my beaten path for a while. So many hilarious things have happened the past couple days. Many of them are probably “you had to be there” moments, but I’ll try to explain them anyway. One of the funny things happened a few days ago. Yama was looking at one of my pictures on Facebook and said something about me being better in the U.S. At first I was confused about what he was saying… but then I said, yeah, my hair and skin is not as nice in Dakar. I can’t take normal showers, I sweat a lot, I’m dirtier much quicker. Then he said, in reference to his physical self, “Yama n’est pas comme sa”, which means ‘Yama is not like this.’ Basically he was saying that in the U.S. he would be even better. It was funny to think about. Okay, so this story is hilarious! In our Country Analysis class, each day someone presents an article from the newspaper. Yesterday Cat was presenting her article to the class, (and mostly to the professor). When she was finished, to conclude, she looked the professor in the eye and said, “…et…je t’aime.” Oh my goodness. As soon as what she said registered, the entire class started laughing. The professor did too, because what else was he going to do. I didn’t stop laughing for about twenty minutes; for some reason it was extra funny for me. For those of you who don’t know French… after Cat finished talking, she looked the professor in the eye and said, “…and…. I love you.” I can’t even think about it without laughing. She meant to say ‘je l’aime’, to say that she loved the article. But professing her love to our old Senegalese teacher was so much better. Today, so many other funny things happened. The stars of the show today were Tori and Waly. Waly because Waly usually is, with his casually dramatic humor and big smile that shows how amused he is at himself, or us. Tori was just crazy all day. Her peak moment was when Waly told the bus driver to stop and told us to look right, at the “monkey wedding”. There was probably 150 or 200 baboons in the field next to us! Tori freaked out. Monkeys were basically the reason she chose Senegal. I don’t know if I’ve ever seen a monkey in the wild, and I’ve certainly never seen that many monkeys at one time. It was insane. We visited Sokone, another small town, and ate lunch at the mayor’s house. Then the people in the village came over and we all had a dance party. It was interesting to say the least. As soon as I have better wifi I will add a picture to this blog post. Categories: Chapter 3 That Dakar Life | Tags: baboon, Cat, Dakar, dance, funny, monkey, MSID, professor, Senegal, Sokone, Tori, Toubacouta, U.S., Waly, Weekend, Yama | Permalink. 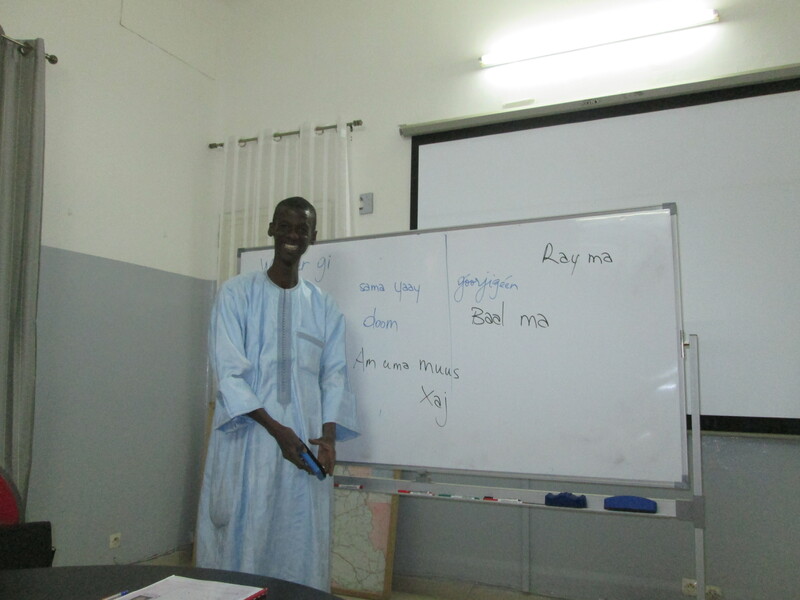 In picture: Sidy teaching our Wolof class. In Wolof, he asked and I told him what my American dad’s name was. Turns out “Ray ma” means kill me. There are also some other interesting words on the board at this moment. I thought I would share the classes that I’m taking this semester in Dakar. All the classes are taught in French by Senegalese professors. Most people have Friday classes but I’m lucky enough not to! This class talks a lot about the history, geography, politics, and social culture in Senegal. We talk about the current events in the newspaper each class. We also write essays about our daily experiences and what we are learning. My favorite class and favorite professor! Sidy (pronounced C-D) is amazing. He is trained as a Peace Corps professor so his methodology is great. It’s impossible not to enjoy learning a language with him, no matter who you are. Half of the 12 students on our program are in this French class with me, and the other half take French on Fridays. I chose to be (and need to be) in the lower of the two levels of French. It’s nice learning French grammar in this class, but I probably learn more French just from the French instruction in all my other classes. There are five tracks that students can take – this one, Public Health, Arts and Culture, Environment, and Economics and Alternative Economies. I chose the Education and Literacy track because it’s something I may be interested in for my career and I want to explore more. An even bigger reason than that is I love kids, (specifically little ones). For the second half of the semester I may want to be placed in a school, unless I can get an internship in something related to international politics or law or something. This is my homework heaviest class. We mostly talk about different development theories and learn about the different states of development in various African countries. Waly, our coordinator here, teaches this class. He’s one of my favorite people I’ve ever met. In this class we talk about how Senegalese culture is, how our internship phase will look, and various other interesting topics. We haven’t talked too much about research methods yet but I’m sure that is coming. Waly is also in charge of placing us into an internship we’re interested in. Categories: Chapter 2 Getting Settled | Tags: culture, Dakar, development, education, French, geography, international, literacy, Peace Corps, research, Senegal, Sidy, Waly, Wolof | Permalink. This was one of the first Senegalese phrases I heard upon arrival, from Waly, during orientation. Instantly I loved it. Over the past two weeks I’ve really been able to see the motto materialize. Every day I see a new instance of someone living out their belief that time is people. One way that you can see this emphasis on people is through the cultural norm of greeting – every one, always. When you enter a house, yours or other, you greet everyone there. On the street, if you see someone you know, or “know”, you greet them. The exchange, once you’re fluent enough in Wolof, isn’t a simple, “Oh hi”. It’s an extended, long exchange of asking about another’s life and family. Even very young children will come and greet you, sometimes with words and always with a handshake. My favorite part of all this greeting stuff is that if you see someone you know while walking somewhere, you stop and chat with them briefly, even if it means you’ll be a few minutes late. It’s not a big deal if you’re late to class if it was because you stopped and talked with someone. When I go places, I try to leave early so that I’m available to give people the time of day they deserve. However, even if I’m running late, c’est pas grave, I’ll stop and talk. People are the most important. Time is people. This motto is lived out in several other ways. People are never in too much of a hurry to stop and help you, even with the smallest of things. When you leave someone’s house they’ll walk you to the door, sometimes a couple blocks, sometimes home. It’s not a safety thing, it’s cultural. If they don’t walk you out, you should think that something happened and they did not enjoy your visit. Waly also explained to us the acronym “W.A.I.T”, West African Internal Time. Have patience; just wait. People here wait very well. You’re a person? They have time. I have time. Categories: Chapter 2 Getting Settled | Tags: Africa, children, class, greeting, money, motto, patience, people, Senegal, time, wait, Waly, Wolof | Permalink. In picture: Cat and I, standing at the western-most point of the African continent. Our professor Waly says if we want to swim home, this is where we jump in. I don’t think I’ve stopped smiling since I’ve been in Senegal. So much has happened already that it’s hard to know where to begin! 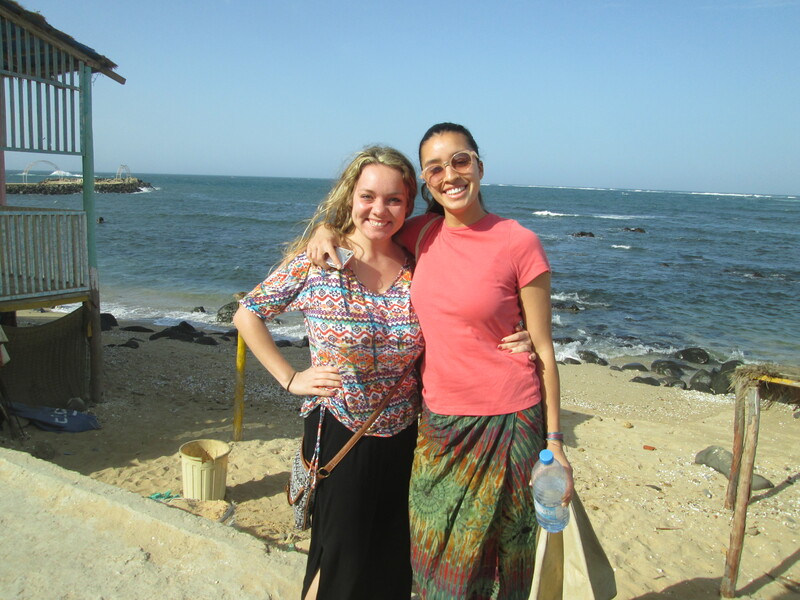 After a tour of Dakar today, and one class about African economics, I met my host family! I also am fully moved into my new room. My house is beautiful. I had no idea what to expect but this house certainly exceeded any expectations I could have had. Like seemed common in Ghana, the central room of the house is open air. The sky is the ceiling. My family is even better than the house! Although my host mother speaks mostly only Wolof, her son, who is probably in his late twenties or early thirties, speaks French and is learning English. His name is pronounced “Baas”, although I’m unsure of the real spelling. My favorite part of living here so far is that Baas runs a school on the roof of my house! I met the children he teaches today, who were so polite and wonderful. I would say there are about 15 students, with various ages and academic levels. Baas teaches them English, and he is excited to be able to ask me questions when he is unsure about something. I adore small children. I’ve dreamt of teaching English abroad for as long as I can remember. I love open air rooms and beautiful homes. I love living a few houses down from the Atlantic, with sprawling, beautiful beaches. I love Senegal. All of my favorite things are merging and I can’t stop smiling. Categories: Chapter 2 Getting Settled | Tags: Atlantic, Baas, beaches, Cat, children, Dakar, economics, English, French, Ghana, host-family, host-mom, school, Senegal, smiling, Waly, Wolof | Permalink.